The UK-China SME Week curtain successfully came down last week. On Monday, 230 delegates from UK and China packed into the conference hotel hoping for face to face meeting opportunities to explore the potential in each other’s market. The forum, expert panels, seminars, exhibition and consultation, one-to-one meetings, and networking were all well attended by delegates from the two countries. 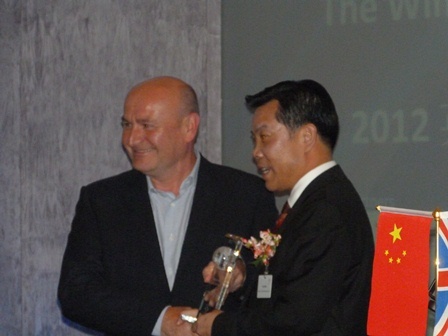 The day ended with Priestmangoode and Hytera being announced as winners of the The Windsor Awards 2012, respectively for Export of British Services and Investment in the UK, as reported in this website. The one-to-one business matchmaking sessions enabled more than a hundred meetings and Mr. Qiu Jibao, President of Feiyue Group and Vice-chairman of China Chamber of International Commerce, said “This tops all my previous visits to the UK. I have two potential agreements from the one-to-one meetings”. Three groups of Chinese business delegates chose to visit Bracknell Forest, Oxford and Slough in the Thames Valley to witness first-hand business opportunities and were impressed with what they saw, as reported by BBC and other media. The day of business partnership building was drawn to a successful close at the award reception when Mr. Qiu Jibao stood up and offered award winner Priestmangoode a contract to design products with his company. There is no bigger growth story at the moment than that of China, which has been the single most important engine for the growth in the world economy since 2008. It has been said in Western wisdom that “friendship begins with trade”. We have all learned that Chinese businesses place trust and the relationship highly when they choose business partners. Finding the right business partner through a trusted source is often half of the way to success in securing an investment, getting an order, wining a contract or nurturing a long term supplier. Investing in finding the right business partner helps to save time, reduces risk and build sustainable international business. It does however take patience, resource, effort, knowledge and skill, especially if one is to be found from a trusted source. With China’s market physically the size of Europe, many need more than one agents or distributors, as well as the local knowledge that is essential when doing business in different Chinese cities and provinces. BCC LinkToChina, the dedicated international business matchmaking service for building business partnerships between the UK and China, is in partnership with two trusted business networks — the Chinese chambers (CCPITs) and the British chambers. The service covers most of China and the UK and it is delivered jointly with a group of reputable professional service organisations. A journey of a thousand miles begins with a single step. So do business partnerships with China. May LinkToChina be your first step to a prosperous journey of doing business with China.